That's how long it took me from the moment I found a package from Hawthorne Threads in the mailbox all the way up until I put the finishing touches on this little satchel bag. When I laid eyes on Alexia Abegg's adorable linen tigers for Cotton + Steel, I just couldn't wait to start sewing. I've had miniature satchel bags on the brain this month, dreaming up designs and wanting to try them out. This was my first effort, and I have to say, I'm completely smitten with the results. I kept this version very simple and relatively small -- about 9 1/2" x 11" x 2 1/2". The bag is lined in black and white linen Mochi Dots, and I used cotton webbing for the straps. All the stitching is done with Aurifil thread in my favorite shade of gold. Several of you have asked me on Instagram if I'll be writing a pattern for this one. The answer is yes. Give me a week or two, and I'll have something up on the blog. And thanks for the encouragement, my friends. Maybe it's because school starts up around here in about two weeks. Maybe it's because I was singing along to music from my college days while I folded laundry the other morning. For whatever reason, when I started putting together a patchwork pillow cover using prints by Cotton + Steel, it occurred to me that this cushion would have been right at home in my dorm room back in the 90's. This pillow is made of 3" squares from the Hatbox, Mustang, and Moonlit collections. I raided a few Kona charm packs for some matching solids to mix things up a little. 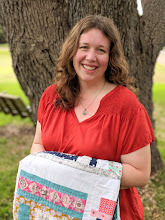 The cover is quilted in a variegated Aurifil thread that glows softly in shades of pink, yellow, and lavender, and I backed it in two different prints from Mustang by Melody Miller. I'm guest posting over at the Riley Blake Designs blog today with a Cutting Corners College tutorial for my Butterfly Patch Baby Quilt. If you're looking for a quick baby shower gift, this is it. My version features Zoe Pearn's sweet fabric collection, A Beautiful Thing, which has some perfectly darling prints in it...my favorite obviously being the butterflies. Head on over to check it out! Yesterday was my mother-in-law's birthday, and we celebrated by spending several days in San Diego with her and my father-in-law. It was a great little vacation -- lots of fun activities and family time. Before we drove down there on Monday, I sewed up a little gift for her. I'm a huge fan of anything by Rifle Paper Co., including this adorable shopping list pad which I picked up at Anthropologie. A few prints by Melody Miller, some twill tape and batting, a rubber band, and a wooden button all came together in about an hour to make a simple little carrier that fits nicely inside a purse. I love quick projects like these which can be easily pulled out when I need a nice gift in a hurry. Happy Birthday, Grandma Mary. We love you! My sister Amy is going on vacation this week and asked if I could sew a bag for her to use on the trip. We talked about ideas, and she drew me a few sketches to work from. 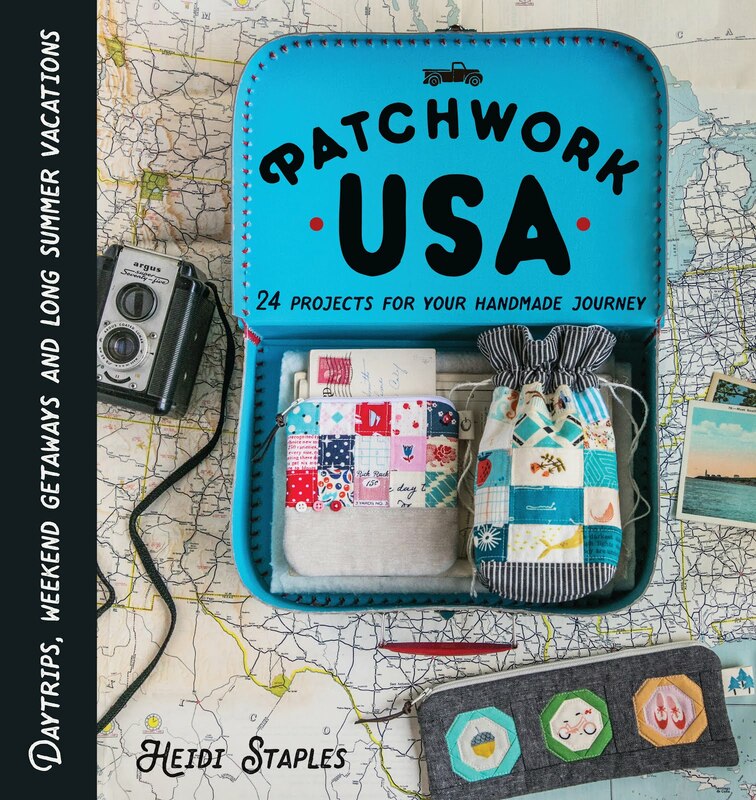 I asked what kind of fabric she liked; she pointed to my recent patchwork mini iPad case and said, "Something like that...I love that." I pulled fabrics, started sewing, and emailed her photos to get approval on details as I went along. The bag features a front zip pocket, a large inner pocket, a small inner zipper pouch with a detachable ring, and a crossbody strap which can also be removed if desired. The main body measures 9 1/2 x 12 1/2" and is about 2" deep, making it large enough to hold a few necessities without becoming easily overloaded. I used black and white linen Mochi Dots for the exterior, while the bag is lined in a bright print by Denyse Schmidt which my sister absolutely loves. And the result is one sweet little bag, reminding me that collaboration really can be a beautiful thing. Ever since I posted my Ellie Travel Case Tutorial, people have been asking if I could share the dimensions for making it bigger. Yesterday I finally sat down to crunch the numbers and sew up a sample, and here it is at last. *All seams are 1/2" except alongside the zipper where they are 1/4" wide. 1. Fuse the batting to the top and bottom exterior panels before you do anything else. 2. Attach the handles to the top exterior panel before you sew the top and bottom exterior panels together. The left handle end is 6" from the left side of the top panel, and the right handle end is 6" from the right side of the top panel. I followed the same procedure for attaching handles that I used in my Ipanema Beach Bag tutorial (minus the outer pocket on this version, though you could add one if you like), sewing 6 1/2" up the handles from the bottom of the exterior panel. I also added a 1" square with an X inside it at the top of the stitching on each side just to keep the handles securely in place. After sewing the two exterior panels together, I topstitched two 1/4" lines below the seam joining them. 3. The squares cut out on the four corners of each exterior panel are 3 1/4" square for this bag size. 4. I did not make zipper tabs for my zipper this time, but you can if you want to. 5. Go even slower as you sew in the zipper on this bag. The Peltex 70 makes for a tough wrestling match, but you can win if you put your mind to it! 6. I added leather thongs to the ends of my zipper sliders on this bag. I love this easy finishing touch. If you make one of these larger cases or decide to go with the original, be sure to tag it #ellietravelcase on Instagram and tag me too @fabricmutt. There are already so many adorable versions of this bag out there, and I look forward to seeing more!